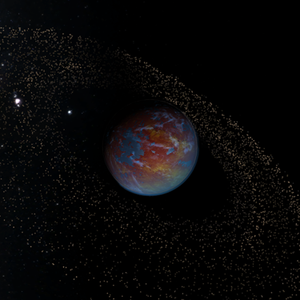 A tropical garden super-earth, Nisp features an impressive ring system extending from 2 planetary radii to around 4.5 planetary radii. With a planetary average temperature of around 31.5 C, photosynthetic organisms maintain photosynthesis year-round over much of the planet's surface. The surface pressure is 2.5 atmospheres, and due to concentrations of nitrous oxide, respirators are required for long-term exposure to the native environment, with temperature-control suits often used as well. Due to Rayleigh scattering, the sky looks a greenish-turquoise, as shorter wavelengths are scattered out by the thicker atmosphere. Much of Nisp is dominated by dense, humid jungles, with large swathes of intermittent plains. The chemical enabling photosynthesis absorbs blue and green light, causing much of the surface to be a brilliant scarlet color. Because of the reduced axial tilt of Nisp, seasonal variation is less than that of the Earth's. A much smaller proportion of plants germinate annually because of this, with most such plants concentrated at higher latitudes. With only 22% of the planet covered in water, the polar ice caps are very small, and the only standing bodies of water large enough to be considered seas are within 40 degrees latitude of the poles. Deserts exist in a large band covering most of the equator, where the temperature often rises above 50C. Active plate tectonics have led to the formation of a number of mountain ranges, and due to eco-conservative policies long-held by the Nisp Planetary Council, they are the centers of all large-scale mining operations on Nisp. Altitude is measured from the lowest point on Nisp, since water doesn't really cover enough of the surface to form oceans at a constant height. Early industry on Nisp consisted primarily of the procurement and export of animal products and pharmaceutical research. Atmospherics interests didn't set up major facilities until some of the early colonies reached out in search of filtration equipment in the 2260's, and the weapons industry didn't become prevalent until the end of the 23rd century, when the NPC began organizing the armies of the various cities. Today, Aether Atmospherics exports a significant portion of its nitrous oxide supplies from the surface and manufactures and maintains most of the filtration equipment used by nearly all major settlements. Zheng-Hu has a number of pharmaceutical plants scattered throughout Nisp's diverse biosphere. Hephaistos has a major weapons testing facility near Janthir. As a garden world with a mild atmospheric hallucinogen, large volumes of food are also exported, and there is a bustling tourism industry. Nisp is controlled by the Nisp Planetary Council, a representative parliament seated in Govoran. Cities with populations over 5 million are given a seat on the council that governs planetary policy, and smaller settlements usually follow the laws of the nearest such city until they grow large enough to gain their own seat. The NPC controls the entirety of Nisp's gravity well, along with a handful of minor stations orbitting elsewhere in the system. The Shadow Coalition tends to have relatively little power on Nisp; much of the populace is either aligned with a TSC, and hence the SEO, or with the IF. Because of the dangers presented by living on Nisp, the Nisp Planetary Council boasts large armed forces stationed primarily in or near major settlements, and most households have at least one gun, causing crime rates to be much lower within cities and settlements than on many other colonies. Community service and victim restitution are the most common forms of judicial punishment. While there are prisons, they're generally only used to imprison those convicted of particularly violent crimes, or serial offenders. A significant portion of Aether's nitrous oxide supply comes from the surface of Nisp. They also manufacture the filtration systems employed by almost all major settlements. Zheng-Hu has been utilizing Nisp's biosphere for pharmaceutical manufacturing for over a century, and much of their products ship from a central plant on the outskirts of Hy Non. The Nisp Planetary Council has a constant struggle with wildlife, and Hephaistos, along with a host of other military industrial contractors, are employed to ease that. The main facility is located a short ways from Janthir.